FUN - FELLOWSHIP - FIREARMS - FUNDRAISING Join Us for an Evening of Fun and Entertainment as we Raise Money for Local Shooting Sports. Tickets are $35 at the Door and include dinner. Blanket with 2A Script - Wrap up in this one-of-a-kind knit throw while showing your support for our right to bear arms. This made-in-America blanket features the Second Amendment in a beautiful script. Made from 100% high-bulk machine washable acrylic, this blanket measures 54''L x 54''W. Created exclusively for Friends of NRA by Binghamton Knitting Company. Don't miss the chance to add this custom Friends of NRA Ruger SR1911 10mm to your firearm collection. This handgun differs considerably from previous pistols and may arguably be one of the best 10mm 1911 handguns ever built. The SR1911 features fully adjustable rear sights, a new front post sight design, and a belled barrel with bushingless lockup. The 10mm auto cartridge is powerful, giving handgun enthusiasts a viable cartridge for hunting. The Ruger SR1911 10mm is a stainless steel pistol built on the full length or Government Model frame. The barrel, slide lock, slide lock safety, and grip safety are a classic black finish. The extended slide lock safety offers a positive indent while both the trigger and hammer are skeletonized. To improve quality, all manufacturing of the SR1911 is produced from the same bar stock and on the same machine. Custom embellishment design, which features the NRA logo in a beautiful gold inlay on the slide. This one of a kind pistol is a highly collectible piece that deserves to be enjoyed on the range and display. Henry Single Shot Brass .45-70 Rifle with NRA Seal - This centerfire single-shot rifle with NRA serialization was born to hunt hard. Henry's brand new line of break-action one-shooters comes with a highly polished finish on a hardened brass frame and features a 22'' round barrel, a fully adjustable folding leaf rear sight and brass bead front sight, a drilled and tapped provision for optional scope use. Crafted of American walnut front and rear furniture featuring a straight English wrist and brass buttplate with an engraved NRA seal on the buttstock plus a non-ejecting case extractor. 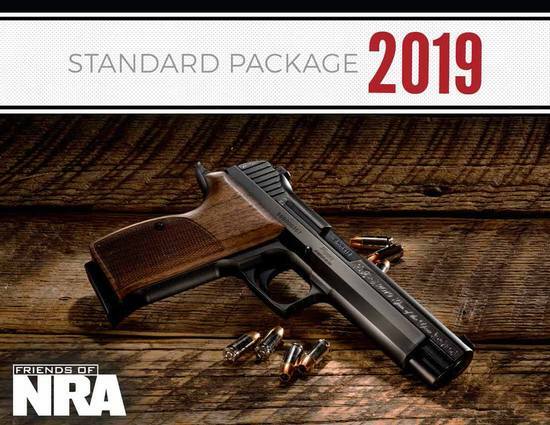 This firearm was made in American exclusively for 2019 Friends of NRA events. You've been outbid to 9****1! to YOU! 'Simple Man' Framed Song Lyrics Signed by Charlie Daniels - These are the hand-written lyrics to "Simple Man," a song written and recorded by the Charlie Daniels Band. Each limited edition print is signed by Charlie himself and includes a numbered Certificate of Authenticity. Framed by Made in USA Framing LLC exclusively for Friends of NRA. U.S. Cavalry Presentation Short Sword - This limited edition replica U.S. Cavalry Presentation Sword contains a beautiful etched design on one side and the NRA logo on the other. Customized by Blue Ridge Knives for 2019 Friends of NRA events. Metal NRA Seal - Made and assembled in the Heartland of America, this 3D Metal NRA Seal is sure to be the center of conversation. Combining metal and design ingenuity, it is more than just a limited edition manufactured piece; it is a one of a kind work of art crafted exclusively for Friends of NRA events. Silver Stag Guide Knife Combo Set - This is true American-made quality. Manufactured by the experts at Silver Stag Knife Company, exclusively for Friends of NRA events the limited edition 'NRA Hunting Guide Combo Cutlery Pack' includes two hand-made full tang hollow ground and jeweled D2 tool steel blades manufactured in full tang construction. The exceptional 5.5'' and 3'' blades (11'' and 7'' overall), are perfect for both heavy and detailed field dressing work. The knives are protected in a custom leather piggyback sheath, and the knives include a lifetime warranty. Barrel Wood Basket - Inspire your home with rustic elegance. Handcrafted using wood from authentic spent wine and bourbon barrel staves, this is the perfect centerpiece for your next tablespace. Every barrel is slightly different depending on age and recipe of the bourbon inside, making this piece truly one of a kind in every way. Designed exclusively for 2019 Friends of NRA events by Columbus Barrel Co.
Red Ryder Teach Freedom BB Gun - Just like the one you grew up with, the NRA 'Teach Freedom' Red Ryder features Limited Edition Red Ryder etching on the receiver, metal cocking lever, engraved 'NRA Teach Freedom' on the forearm, 650 shot capacity and a cross-bolt trigger block safety. Perfect for introducing youth to gun safety and the fun and excitement of shooting. Created exclusively for Friends of NRA by Daisy Outdoor Products. Copper Wind Spinner - Say goodbye to the stationary yard stake with this hand crafted copper spinner with cut-outs of the Friends of NRA logo, AR-15 rifles and bullets. With each 'Breeze of Freedom', this copper-colored wind spinner creates a mesmerizing kinetic display of Second Amendment pride. This limited edition piece is available exclusively at 2019 Friends of NRA events. Decanter and Rocks Glass Set - Every drink taste like freedom with this limited edition Decanter and Rocks Glass Set. The set includes an etched Decanter with the Friends of NRA logo and two 11 oz. 'Bulletproof' rocks glasses which are embedded with real solid copper bullets. Each lead-free glass is unique and handcrafted in the USA.